Not all snowflakes look like six pointed stars. Many do, but there are also quite a few odd-looking crystals falling from the winter clouds. You will see them if you go out looking, but it helps if you know what to look for. On this page we examine a few examples from the snow crystal menagerie. 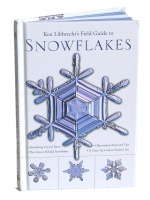 Ken Libbrecht's Field Guide to Snowflakes. Click on the link to see the book on Amazon, including a look inside. 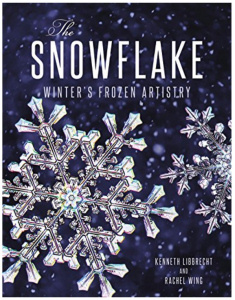 If you would like to learn more about snowflakes, and what kinds of crystals can be found, this is the book for you. It makes a great gift for anyone who enjoys the outdoors as well. The chart on the right lists 35 snowflake types, which covers most of what you will find under your magnifier. Exactly how many different kinds of snowflakes are there? There is no exact number; it depends on how many types you care to define. See the bottom of this page for more about that. 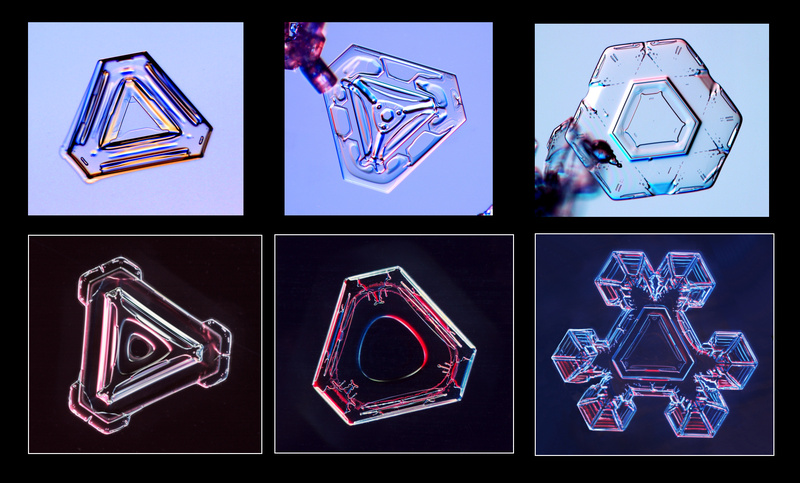 These are the most recognizable snow crystals, as you can see from the examples on the right. Their name comes from their star-shaped appearance, along with their branches and sidebranches ("dendrite" means tree-like). Stellar dendrites are also quite large and common, so they are readily spotted on your sleeve, especially if you are wearing a dark fabric. The best specimens usually appear when the weather is quite cold -- about -15 C, or +5 F.
Columnar snow crystals appear when the temperature is around -6 C (21 F), and they can be quite common. They are small and easy to miss, however, as they look like small bits of white hair on your sleeve. Especially long, slender columnar crystals are often called needle crystals. "Hollow columns" have conical hollow regions in both ends, as shown in the drawing and several of the examples. These are my favorite snow crystal type that no one seems to know about. They are not common, but they are actually pretty easy to find if you go looking for them. A basic capped column is shaped like two wheels on an axle, or an empty spool. Multiply capped columns have additional plates between the outer two. Think empty spool when you look at the image on the upper-right corner, and you will get the idea. A capped column forms when it travels through different temperatures as it grows. First a column forms (around -6 C, or 21 F), and then plates grow on the ends of the columns (around -15 C, or 5 F). Next time it snows, consider it a challenge to get a magnifier, go outside, and see if you can spot some capped columns! These crystals are like Stellar Dendrites (above), but larger and leafier, with many sidebranches that resemble the branches of a fern. If you look carefully, you will see that the sidebranches mostly run parallel to their neighboring branches. You will also see that these crystals are not perfectly symmetrical. The sidebranches on one arm are not the same as those on the other branches. 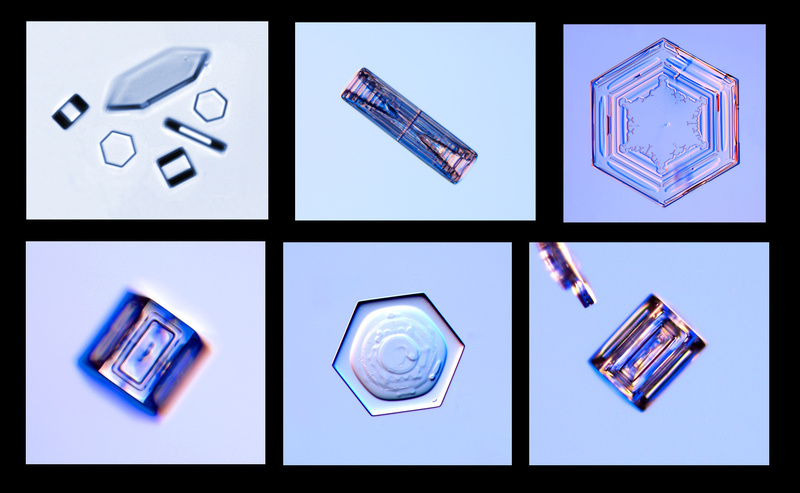 These are also the largest snow crystals, and specimens up to 5mm in diameter can be found. The largest snow crystal ever photographed (to my knowledge) is this monster. These tiny snow crystals look like sparking dust in the sunlight, which is where they get their name. They are the smallest snow crystals; many are no larger than the diameter of a human hair. They are most often seen in bitter cold weather. The basic ice crystal shape is that of a hexagonal prism, governed by crystal faceting. 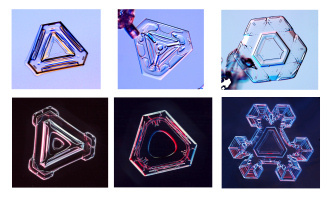 One panel on the right shows a group of small laboratory-grown crystals that are nearly perfect simple hexagonal prisms. It appears that aerodynamical effects help produce these unusual snow crystals. They are typically small, shaped like truncated triangles. Sometimes branches sprout from the six corners, yielding an unusual symmetry. If two small six-branched snow crystals collide in mid-air, they might stick together and grow into a twelve-branched snowflake. You might think such ideal collisions would be rare, but twelve-branchers are actually not too hard to find if you keep an eye out for them. Snow crystals grow inside clouds made of water droplets. Often a snow crystal will collide with some water droplets, which freeze onto the ice. These droplets are called rime. A snow crystal might have no rime, a few rime droplets, quite a few, and sometimes the crystals are completely covered with rime. Blobs of rime are called graupel, or soft hail. Just how many different types of snowflakes are there? We have examined the more common forms here, but what is the complete list? In fact, there is no answer to this question. There is no absolute classification of different snowflake types, and there can never be one. To understand the dilemma of naming snowflakes, consider a different question: how many named colors are there? There are the standards, of course—red, green, blue, yellow, orange, etc.—but is there a complete list of all color names? No, and there can never be a definitive list. The Sherwin-Williams paint company has its own table of over 1500 colors. The whites alone number 184, including Origami White, Feather White, Alluring White, Frosty White, Superwhite, Nouvelle White, Nebulous White, Nonchalant White, and Snowfall. You get the picture. While many color charts are being used for many purposes, there is simply no absolute list of color names. You run into similar difficulties when you try to make definitive lists of all sorts of things—types of breads, cookies, or pastries; articles of clothing; breeds of dog; types of hobbies; musical instruments; etc. People do organize and catalog all these items. But different people have different lists. We name snowflakes for the same reason we name anything—so we can more easily talk about them. 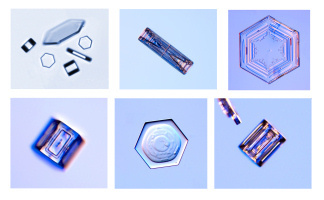 Certain snow crystals are common and distinctive looking, and those have fairly well-defined names. 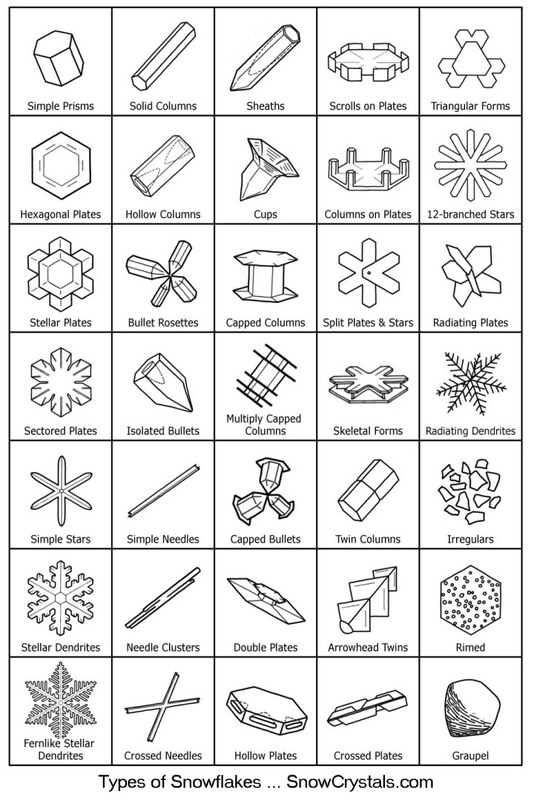 Stellar plates, stellar dendrites, fernlike stellar dendrites, hollow columns, and capped columns have all been part of the snowflake vocabulary for some time. Go significantly beyond that, however, and opinions differ. In an effort to be inclusive, perhaps, tables of snowflake types have become larger with time. In the 1940s the largest classification chart included 41 members. This number jumped to 80 in the 1960s, and recently a new table appeared with 121 different snowflake types. The chart above shows our preferred snowflake classification. Since there can be no such thing as a final, definitive catalog, we pared the number down to one we consider convenient for snowflake watching. 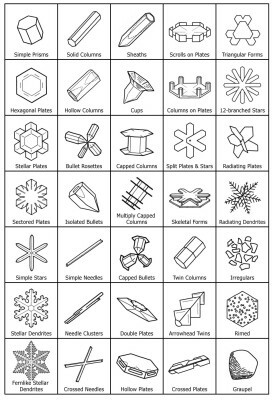 We described many of these snowflake types in the preceding pages, and the chart gives you an idea of what other kinds of snowflakes you might encounter. When you go outside to look at the falling snow, magnifier in hand, you can use this chart to guide your search for exotic snowflakes. You are more likely to spot a triangular crystal, a bullet rosette, or a double plate, if you know it exists.